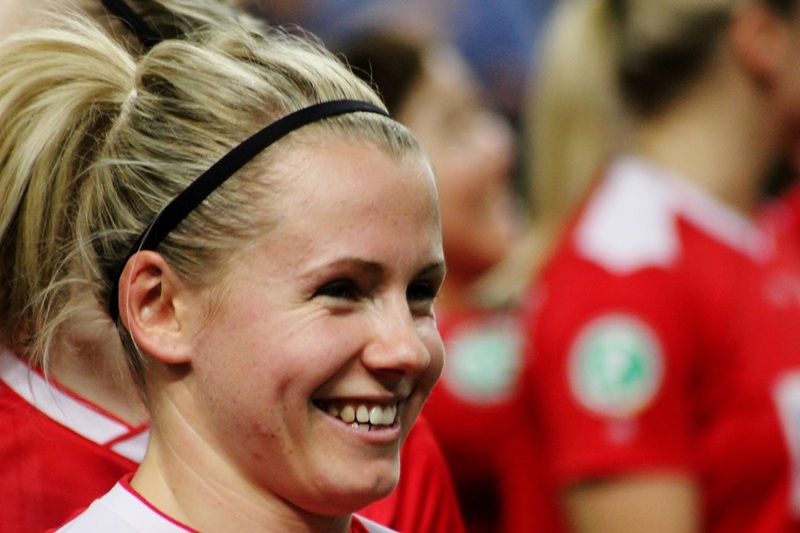 Julia Simic, 24, is talking about the hard injury-period, the transfer to Potsdam and the Hallencup-victories. (All pictures: Andreas Kristoffer Berge. See a small picture gallery at the bottom of the article). And Turbine went trough the whole tournament without even loosing a single game. Last years champions, Brøndby, was not suprisely the hardest competition for Turbine also this year. But this time it was Potsdams time to win it. With a total of 5-0 in the final, Potsdam crushed every doubt and won the tournament. Two weeks ago, Turbine also won the DFB Hallencup. That became Simics first tittle with Turbine. She came to the club last summer (2013) after a lot of years in Bayern Munich. And after a strong victory against Lyon in the Champions League, Turbine is still in the fight for the trophy. Now they meet the Italian team, Torres, in the quarter final. The victory against Lyon is one of Simics greatest highlights at Turbine so far. In Potsdam the fans are different to other places. A sold out arena made an incredible atmosphere in the MBS Arena throughout the tournament. In 2011 she got an opportunity at the national team, but at a training it went wrong. She got a anterior cruciate ligament (ACL) injury in her left knee and was out from football for 6-7 months. And if that was not enough. Just after she made her comeback in the Bundesliga, she got a new injury in her left knee. And once again it was an ACL injury, and another half a year out from the football. After the injury period she came back for full this season, but many feared the worst in the end of November / beginning of December. 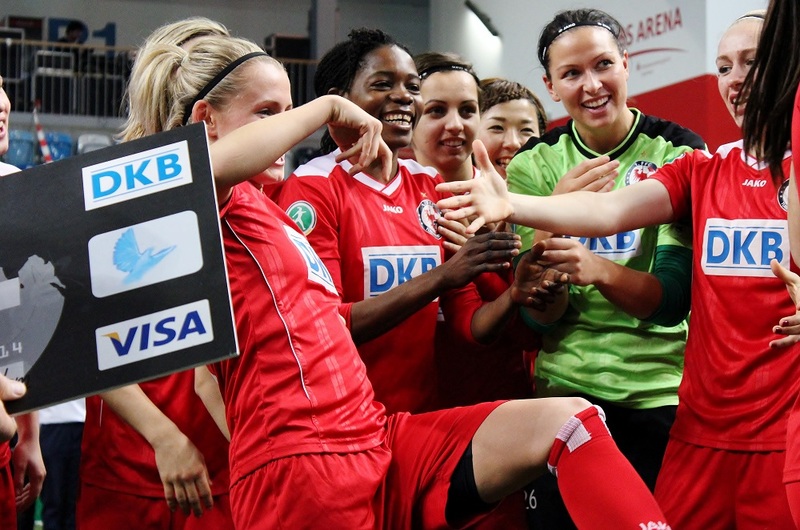 She had to leave the field in a game against Cloppenburg, and also this time it was her knee stopping her. Everyone feared it was another ACL injury. Happily. This time it was just a little pressure to her knee and she was back on the field fast after. To AKB News, she are talking about the hard injury period. And with such a long time with an injury, it was important with support. Simic continues to talk about the hard period. And now she is back in the game and she shined now and then under this weekends tournament in Potsdam. The 24 year old tells that she is best at giving assists, but this weekend she also got herself four goals, where one of them was scored in the final. «It is always a highlight to score, but I am usually the player that gives the assist. But I like to score as well tho, so maybe I should start scoring a bit more often,» the charming girl laughs. And with Ada Stolsmo Hegerberg playing beside her, she helped with a lot of assist to the Norwegian girl. Born: 14.05.1989 in Fürth. She have a German mom and a Croatian dad. She also have an older brother. National Team: Played for U15, U17, U19, U20 og U23. Been at the National A-team, but no games due to injury. Neste Info om årets PDF-magasin! and HCG for fertility purpose (10,000 IU) is significantly different.